If you’re a reader of this website, you probably already know what runes are, but just in case you don’t; runes are an ancient Norse alphabet used for magic, communication, and divination. If you want to learn more, you’re in luck because I’m here to tell you about THE book about runes. 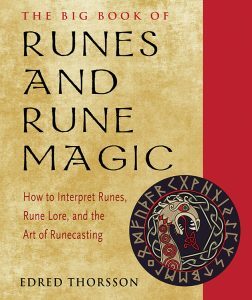 “The Big Book of Runes and Rune Magic: How to Interpret Runes, Rune Lore, and the Art of Runecasting” by Edred Thorsson is 320 pages of EVERYTHING rune. Thorsson has written THE book on runes. Actually, he has written over two dozen books about runes and all that research has culminated in “The Big Book of Runes and Rune Magic”. It starts with an amazingly deep dive into the history of runes. Viking age, medieval, and modern runic history is discussed. This includes the history of runes in magic and divination as well. Then, utilizing this research Thorsson examines what he refers to as the hidden lore of runes. How the runes relate to cosmology, psychology, and the Gods. Only after a thorough study of these previous two sections are you ready to read the runes. Thorsson discusses divinatory theory and provides useful tables. I’m loathe to say one book on any subject is all you’ll ever need, but “The Big Book of Runes and Rune Magic” by Edred Thorsson is as close as you’ll get.